The widow of Alexander Litvinenko has said former First Minister Alex Salmond would be “better to give up” his TV show on the Russian channel RT. Marina Litvinenko’s husband, an outspoken critic of Vladimir Putin, died after drinking tea laced with radioactive polonium-210 in 2006. A public inquiry a decade later concluded that his killing had “probably” been carried out with the approval of the Russian president. Now his widow has spoken out about former SNP leader Mr Salmond’s controversial show on RT. Ms Litvinenko said the former SNP leader’s decision to host a weekly show on the on the channel “can’t be excused”. The Alex Salmond Show on RT has come under fire from the widow of Alexander Litvinenko. “You [Salmond] are doing this because you believe you might do good things, in a wrong place,” she told the Sunday Herald. “It doesn’t work. My message is that I believe he is a people’s man, and everybody can make mistakes, but you need to think twice. 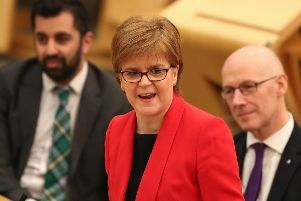 Mr Salmond’s decision to host a programme on the network has been criticised by opposition politicians as well as his successor as First Minister, Nicola Sturgeon, who said she would have “advised against RT and suggested he seek a different channel”. The broadcaster has been accused of being a Kremlin propaganda machine, although it claims its journalists are independent. Mr Salmond, who has been contacted for comment, has said he retains “full editorial control”. Last week, Defence Secretary Gavin Williamson branded RT a “Russian propoganda channel” and advised MPs against appearing on it.